Few bands are successful enough at creating their own individual sound that I find it impossible to adequately identify their genre. Agalloch, however, are one such band. Hailing from the Pacific northwest of the US, they do not fit comfortably within any established metal genre, and indeed push the genre in new directions. Black metal? Their earliest nineties demos are clearly rooted in the genre, and John Haughm’s vocals owe more to black metal rasps than death metal growls, but even by Pale Folklore, the band’s impeccable and evocative 1999 debut album, they had progressed beyond black metal. Folk metal? Sure, the band draw upon folk and pagan themes, but they sound very little like almost anything else in the folk metal scene, and create more of a metal form of neofolk. Post-rock or post-metal? Well, yes, there are obvious homages to those genres in the guitar playing and extended passages, but nothing that especially defines the sound or boxes Agalloch in. Atmospheric metal? What does that even mean? That could be applied to a whole range of otherwise dissimilar bands, from My Dying Bride to Drudkh or Orphaned Land; if any band has earned the title “atmospheric”, it is Agalloch, but it’s insufficient for categorisational purposes. I tend to settle for the over-long “blackened atmospheric folk post-metal”, in the hope that despite how ludicrous it sounds, it actually does something to accurately identify the sort of music Agalloch play. 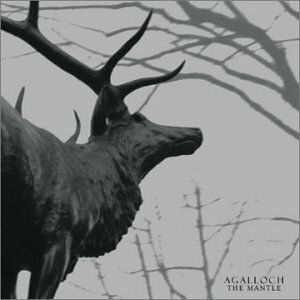 The Mantle, from 2002, is often hailed as Agalloch’s finest album to date. Personally, I find their three albums to all be roughly equal, a testament to Agalloch’s consistent talent and vision. The harshest black metal overtones of Pale Folklore are gone, replaced by mellower – but deeply melancholic – acoustic passages rich with the atmosphere of sparse forests as autumn descends into winter. John Haughm sings cleanly much more often on this release than almost any previous Agalloch album, but his harsh vocals are still at full strength – arguably the most comprehensible in the business. It would be fair to say that often Haughm blurs the lines between clean and harsh vocals. The interplay between multiple guitars is a trademark of this album, as heavy riffing, acoustic strumming, and atmospheric, restrained electric passages blend together. I Am The Wooden Doors is an effective reminder of just how heavy Agalloch can be when they so desire, and culminates in a stunning and stunningly bleak statement of intent with the passionately delivered lyrics “I wish to die! with my will and spirit intact; the will that inspired me to write these words”. It would be grossly unfair if I fail to mention the remainder of the songs on this album, but for the sake of brevity, I shall be grossly unfair all the same. Every track is a highlight. I cannot point to a single weak moment, and the sequencing of the songs creates a cumulative experience unlike anything else within – or without – the world of metal. The more I listen to this album, the more highly I regard it. Its soundscapes, so gripping and vivid when I first encountered them, have become fondly familiar; it is, in many cases, like a hometown or a favourite destination – just when you think you have exhausted its potential, you turn a corner or dig deeper and suddenly you realise all over again why you love it, and have the experience of new discovery all over again. I have spent years with The Mantle, and age has not wearied it. The more I live and the more I experience, the more The Mantle resonates.